Hi loves! A while back Cirque Colors released the Back to Basics collection. a 4 piece set consisting of the Cirque Holdfast base coat, Cirque Liquid Laminate top coat, a black creme called Memento Mori and a white creme that's named Carpe Diem. You could say these are the ultimate basics a polish lover needs and today I am showing them to you and share my opinion about them! What's really nice about this set, is that you can buy all 4 pieces together in a vinyl pouch for the price of $36. That's a $10 savings compared to the bottle price! First up let's talk about the base and top coat. The base coat called Holdfast has a blue tinge to it that's not visible on the nails and is infused with garlic so it strengthens and provides an anchor for the color on top. The consistency is very thin so make sure you don't load up your brush or you'll flood your cuticles. Because of this thin consistency it also doesn't hide ridges. Drying time is quickly and it seems to perform well regarding stain prevention. The top coat named Liquid Laminate is thin too, and incredibly shiny in finish. It dries really really fast on me but body chemistry really influences things like this so don't pin me down on that! Unfortunately, it doesn't seem to wear very well for me but the fact I have long and rounded tips now might be a factor as well. I do like it a lot for the fast drying time and shiny surface! Now, for the creme colors/ First up is Cirque Carpe Diem. Everyone knows that white polishes can be difficult in formula. They're often streaky, uneven and patchy and require multiple coats to give a good result. Carpe Diem is my new favorite white shade. It only needs 2 thicker coats and levels beautifully. The secret might be that there is actually the tiniest hint of golden shimmer in this beauty. You can only see it on the first coat, but it's there. This also dries to a gorgeous shiny finish. 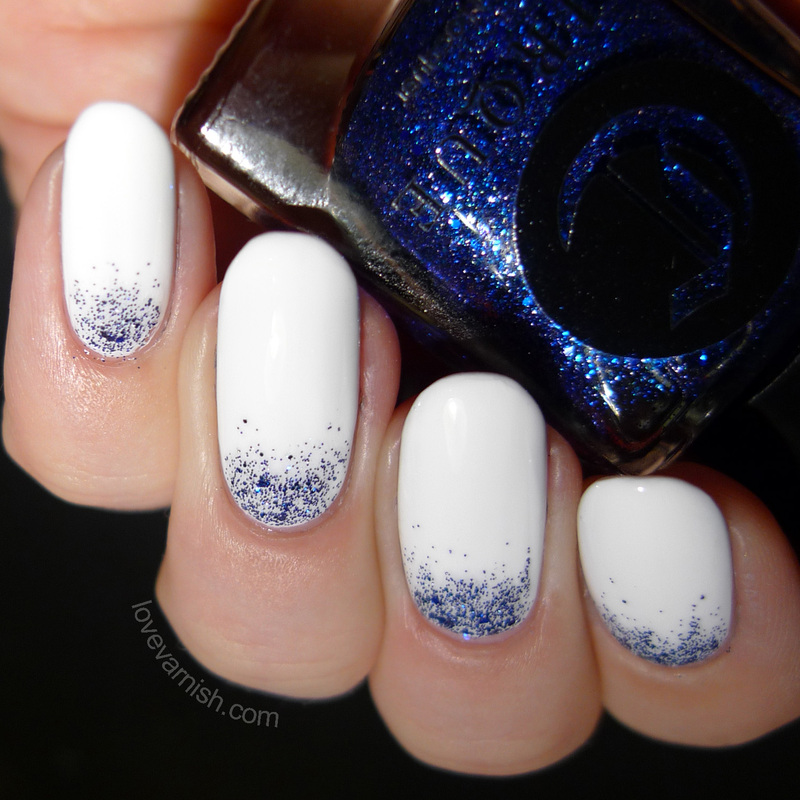 To accent the beautiful white base, I used Cirque Lapis to add some sparkle to the base of my nails. Just wipe off the brush as much as possible and brush on what's left in short strokes to create this gradient look! The other creme that's part of the Back to Basics collection is Cirque Memento Mori. 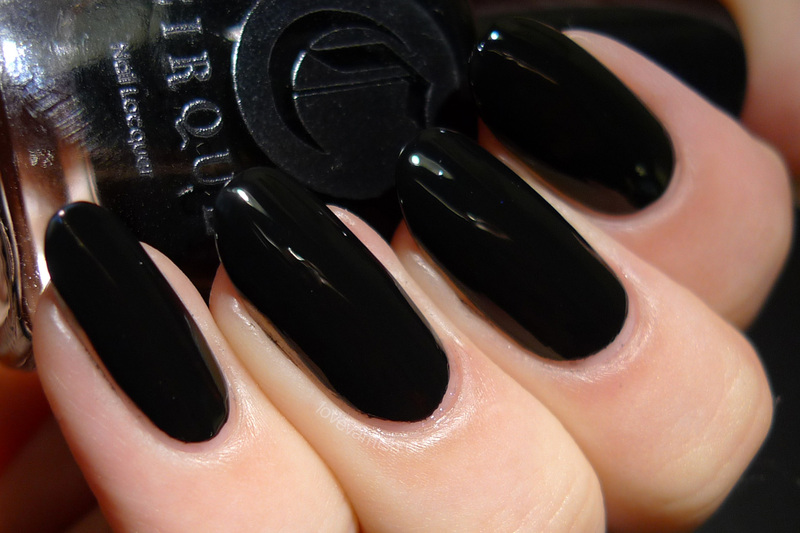 This is a perfect, 1 coater, glossy black. No really careful kind of 1 coater, but a slap-it-on-you-are-done type of 1 coater. Such a great thing to have in your stash! It also stamps really well and is easier to remove than Konad Black :-). Again, I did a little gradient (but on the tips this time) to highlight the perfect base, this time using Cirque Hellebore. Those purple glitters really stand out this way! What do you think of this collection? Anything you'd like to try? Tell me in the comments! Currently the set is out of stock but all products are available on www.cirquecolors.com (worldwide shipping available). The base and top coat retail for $10 a bottle while the cremes are sold for $13. There are also various stockists selling Cirque polishes so be sure to check if you can shop more locally, too. That black and white are perfection! They look so thick and creamy! I think her shape looks great - and the swatches are absolutely impeccable! Bravo! I love this! I'm a complete newbie with this technique but I definitely want to try! That white looks like a must have staple! Great swatches! I am sorry that the nail shape influences your appreciation so much. I figured good pictures and lighting were the important thing here.. I agree! And I see what you mean with thick, though they aren't thick on the nails they do have that luscious look :). An added bonus is the lovely scent Cirque polishes have :). Aww thanks Em <3 you should try it too! I am sure it'll come out even better! Aww that's really sweet :). It was so much fun to create this look :) I am thinking to do it again but with teal/turquoise shades! Yes this is something you could totally ROCK! There's one in the original post about this look: http://cassispeach.blogspot.com.au/2014/08/monochrome-flower-stamping-with-youtube.html hope that helps :). Glad to hear you think so Destany :). Aww thanks for your sweet comment! I always love being inspired by others so credit obviously has to happen properly ;-). So much fun and really easy! Thanks dear! It's actually so simple, just a few steps :). I'm not a fan of monochrome but I absolutely love this! Everything goes together so perfectly!